On Monday, February 11, 2019, dozens of skiers and snowboarders will descend 100,000 vertical feet in a single day—107 runs at Whitetail Resort in Mercersburg, PA. 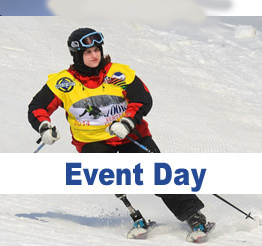 This event aims to raise funds for and awareness of Two Top Mountain Adaptive Sports Foundation. 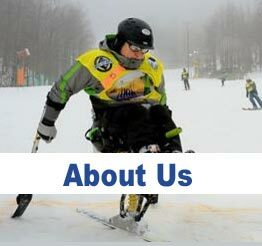 Two Top provides adaptive cycling, ski, snowboard and water ski lessons to disabled individuals, including wounded veterans from Walter Reed National Military Medical Center, Fort Belvoir and surrounding VA Medical Centers. All lessons for our disabled veterans and their families are FREE. Last year, Two Top provided over 650 lessons to disabled athletes during the winter and summer. Over 470 of these lessons were disabled veterans and their family members. NEW THIS YEAR: VIRTUAL TEAM - Even if you can't be with us on February 11th, you can help us raise money by counting all the runs you ski or ride no matter where you are. TEAM TWO TOP - No team needed. 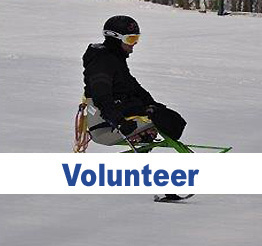 Join other skiers and boarders who volunteer and support Two Top by joining this team. This fundraiser is a team only event. Each team can have up to ten members, with a minimum of four. A team of four will have a minimum fundraising goal of $2,000 (same goal as last year). As with last year, all funds raised by each team member will contribute to the team goal. Note: For teams of more than four members, an additional $500 per person will be added to the team goal. ie. If you have 5 team members, the team minimum rises to $2,500 and so on. The event will begin at 8 am and end at 1 pm. Registration begins at 7 am. Drinks and snacks will be provided throughout the day. Lunch will be at 1 pm and donated by Mission BBQ of Annapolis, MD. They always provide a great meal. If you are not participating in the event and want to attend the lunch, please contact Stacey at stacey@twotopadaptive.org. When you register as a team member, please let us know if you will be attending the lunch. A check box has been provided on your registration form. We are always looking for corporate sponsors. Sponsorship levels can be seen here. If you know any, please let us know. Volunteers are needed throughout the day. Please sign up here.